When I was 10 years old my parents operated a campground in the summers for families camping in tents and trailers. It was located in the Great Smoky Mountains of western North Carolina and my brothers and I spent delightful summers working and playing alongside our family and friends. Dad had an old Ford truck and every time we children heard the engine crank, we ran to ask if we could go along for the ride. We would jump in the back of the truck, make sure our “bottoms were on the floor” and off we would go. Sometimes Dad would say, “Do you want to go with me?” since he knew we enjoyed feeling the air rush through our hair as it cooled us off on a hot summer day. We never asked “Where are you going?” It didn’t matter. We were along for the ride. We didn’t care about the route or destination because the ride itself was exciting. Thinking about it now brings back a flood of pleasant memories. If my memory serves me rightly, the majority of the trips were to Sylva Coal and Lumber or Vance’s Hardware Store. 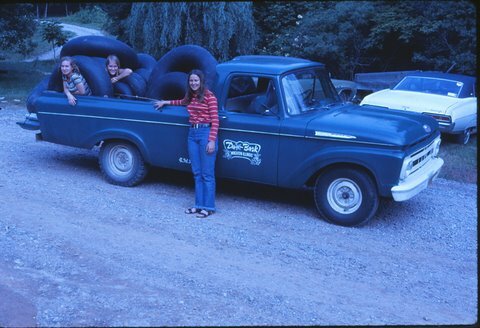 Dad would buy supplies for campground repairs, and we would return home, riding in the back of the truck with whatever he had purchased. God wants us to respond to Him in much the same way my brothers and I responded to our father. He has called us to follow Him – He often doesn’t tell us where we are going or why. We may not know where we are going, but we do know who we are going with. When God called Abraham ( Abram at that time) to a foreign land, He didn’t tell him much about the destination. Abram knew God and trusted Him. The Bible is full of people who walked by faith. There are also numerous accounts of those who didn’t and the results aren’t pleasant. I realize as I get older that it is the process of following God – or journey itself – that is important, not just the end result or the destination. Being an effective mother is losing our right to our own way, as we stated in an earlier post. Yet I know that too often I have focused on the “goal” ahead of me instead of following God – whether the goal was getting the babies out of diapers, helping them learn to talk, walk, feed themselves, etc. Instead, I should see the day-to-day challenge of being a mother as significant. If I could see each day as a “ride in the back of the truck” instead of a destination that must be reached I believe it would facilitate my desire to be a follower of God. As I relinquish my control over the destination – “losing my life” – God will take me where He wants me and I will “find my life” in Him. I often try to get our kids to reach milestones- it’s hard not to. Baby Daniel is teething at 9 months old- I shouldn’t want him to get teeth since I am still breastfeeding, but I want his discomfort to ease, so yes, I want the teeth! Phillip got teeth at 5 months and bite me hard- and Samuel graciously waited 11 months. And as soon as he starts crawling forwards instead of his current backwards, my life will change even more- he’s already finding himself under couches and getting stuck. I still want him to crawl. But you’re right, Momma, I need to enjoy the little things each day. Your post also made me think about following my husband wherever, too. He took me way away from home- from DC to Hawaii and then to the Pacific NW. We aren’t anywhere close to immediate family, and definitely want to be soon, but I will follow him anywhere. His sons need to see him content at working and I need him to like his job, so wherever that takes us, we’ll be together and a family.